The first comes from the Gabriella Miller Kids First Research Act, which will give the agency $126 million spread over 10 years. The purpose is to fund studies into a range of childhood diseases and conditions from pediatric cancers to juvenile diabetes to childhood obesity and more. The agency received the first $12.6 million annual installment last December. The second funding source comes from the remainder of the funds allocated to the now-defunct National Children's Study (NCS). NIH Director, Dr. Francis Collins suspended the ambitious longitudinal study in June 2014. Following an evaluation of the program by NIH's Advisory Committee to the Director (ACD), which found the program too expensive and unwieldy to continue, Dr. Collins shuttered the program for good in December. Congress allocated $165 million for the study during FY 2015. Some of that money will go toward closing the 7-year Vanguard study, the pilot program that was to precede the main study. The main study would have begun this year. After closing the pilot program, there will be $140 million available to fund similar projects. The data from the Vanguard study is available to researchers. The goal of the NCS was to learn about the environmental, social, and psychological factors that impact pediatric health. Researchers planned to study 100,000 children in the U.S. from before birth to age 21. Initially, researchers planned to recruit pregnant women by going door-to-door in 100 U.S. counties. The ambitious study was not designed to take advantage of new technologies like social media or to leverage the mountains of health data that have been collected by electronic health records (EHR) in the nearly two-decades since it was first envisioned. Dr. Collins and others at the Institutes expect the remaining funds to be used for smaller, more streamlined studies with goals that are similar to those of the original NCS. Gabriella Miller was a 10-year-old 5th grader from Virginia who gained international attention as an advocate for pediatric brain cancer during her nearly year-long battle with an inoperable brain tumor. 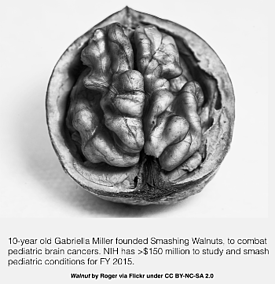 During her illness, she, along with her family, established Smashing Walnuts, a non-profit organization that funds pediatric cancer studies. Her name was added to the Kids First Act shortly before her death. Last week, NIH's Council of Councils met to hone in on specific uses for the funds. At meeting time, there was still a great deal of uncertainty about specific funding areas, but the agency expects to have a firmer plan by the spring. The more-than $150 million windfall is only available for use or allocation during the 2015 fiscal year. If NIH doesn't use the funds, they'll lose them.